Autumn catalogue includes Macrae's Sunshades in October and Manmohan Singh's "Demand Theory and Economic Calculation in a Mixed Economy"
The Economist. Saturday, 30 November 1963. Page 57. Vol 209, issue 6275. The Economist. Saturday, 25 September 1965. Page 3. Vol 216, issue 6370. No Christ on The Andes - What's Gone Wrong? Pages s9-s11. Vol 216, issue 6370. The Economist. Saturday, 15 October 1966. Page s3. Vol 221, issue 6425. 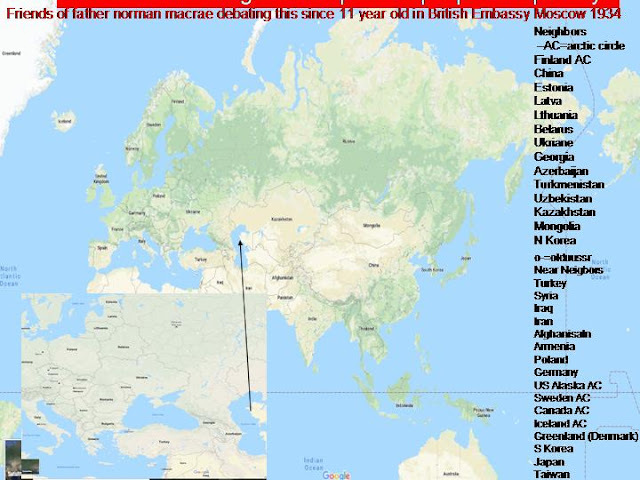 The Next Ages of Man was the final survey written by Macrae as deputy editor of The Economist, though of course he went on to write a number of further articles by invitation. 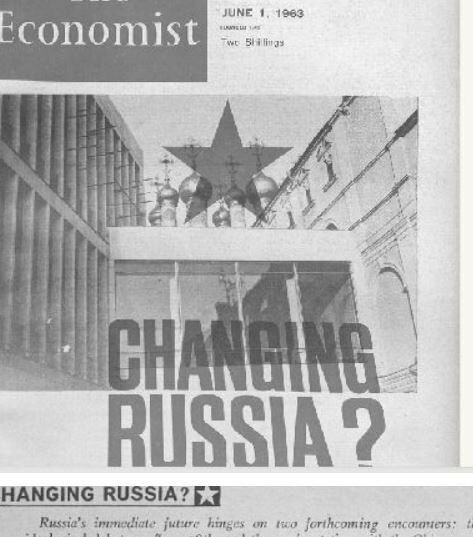 The original was published in the Christmas & New Year edition of The Economist in 1988 and is here presented in five parts. 1 - Arrived, but haven't noticed2 - Too Right3 - The children's renaissance4 - The future shape of business5 - Old men don't regret. Within a hundred years, guessed Maynard Keynes in 1928, the standard of living in Western Europe and America "will be between four and eight times as high as it is today". Since nobody could sensibly wish to consume four or eight times as much as he did in 1928, people would come to recognise the pursuit of money for “what it is, a somewhat disgusting morbidity, one of those semi-criminal, semi-pathological propensities which one hands over with a shudder to the specialists in mental disease”. “For the first time since his creation”, enthused the Arts-Theatre-founding Keynes, “man will be faced with his real, his permanent problem - how to use his freedom from pressing economic cares, how to occupy the leisure, which science and compound interest will have won for him, to live agreeably and wisely and well”. From his observation of the very rich, who already had four-to-eight times the normal person’s income in 1928, Keynes did not think man would be very good at this, and he went on to one of his homosexual-chauvinist diatribes that women in the well-to-do classes looked to him like being even worse. Sixty years on, in 1988, the real GNPs of the United States, the EEC and Japan are between 31/2 and 18 times what they were in 1928, although with awkwardly more people to eat those GNPs up. The United States, like Britain, is a relative slowcoach. See chart. America's real GNP in 1988 is six times its 1928 level, but its population has doubled. The average American’s real personal disposable income has multiplied 2.9 times since 1928, and his consump-tion has increased slightly more. There is no sign of bored affluent people deciding not to spend too heavily, as Keynes had expected. Instead, all the rich countries’ peoples are borrowing like crazy to make the purchases they could most easily postpone. Americans now buy annually over ten times as many consumer durables as they did in 1928. However, as in Western Europe, the most voracious rise since 1928 is that real annual expenditure by America’s central government has multiplied more than 19 times over. One might therefore suppose there has been an especial rise in the satisfactions that are traditionally the aim of government: less fear that America’s sons might be killed in foreign wars, more effective crime prevention, greater social cohesion. Things have moved exactly the other way round. In Japan the rise in real GNP has been over three times as huge as in America (having multiplied nearly 18 times since 1930), but central-government expenditure has gone much less (multiplied under six times). Despite this image as “an appallingly low public spender”, the satisfaction in things provided by government in Japan has gone up much more than in America or Europe. The average Japanese has much less fear than in 1928 that her or his son might be killed in foreign wars. The poorest three-quarters of Japanese 17-year-olds are startlingly better educated than their equivalents in 1928 Japan or in 1988 America or Britain, at a lower taxpayers’ cost per head. Japan has moved from a high Asian infant-mortality rate into the lowest infant mortality ever attained by woman anywhere. It has carried through the first industrial revolution in world history during which crime rates initially went down. It does still have a sense of community and social cohesion (low rates of divorce, juvenile delinquency and drug abuse, the unvarying re-election of a rather boring conservative government all through the past 40 years). Although left-of-centre people will find this appalling, it is more than conceivable that Japan shows the way that successfully governed countries will go. In Western Europe there has been one strange similarity to Japan, because the areas most knocked about during the 1939-45 war surged most quickly above their 1920s income levels during the 30 years immediately after it. But in Western Europe (and especially Britain) there has been a clear drop in the quality of life for one group: among the sort of European women who in 1928 were cosseted domestic servants not just the leisured ladies against whom Keynes railed, but most upper-middle-class mothers of small children. There has therefore been a drop in upper-middle-class small children. In Europe the rise in standards has been fast lowest down, among the sorts of ordinary working Englishman or Frenchman who in 1928 owned only one pair of trousers. As in America, it has been fastest of all for working-class married women. It is therefore a pity that married women are virtually disappearing among the groups that have most need of a lot of them. Last year three-quarters of the black babies born in the big inner cities of America were births to unwed mothers; of these, half were to teenagers. The fig-ures for some other poor ethnic communities, al-ways excluding the close-knit Asians, are not much better. Because America’s WASPS (white Anglo-Saxon Protestants) stopped having so many babies 24 years ago, and because that makes for fewer WASP mothers now, the present estimate is that 30-40% of young adults entering America’s workforce in 2007-27 will he black or Hispanics. This will be happening just when the huge 75m-80m lump of nearly nine-tenths-white baby-boomers born in 1946-64 will be retiring to Florida, and expecting to live for an expanding 20-25 years on ever more fabulously expensive Medicare services financed by the payroll taxes which these new black and Hispanic workers and voters pay. teeming poor south and west; it wisely automated its factories and kept its public services slim. Meanwhile, in the WASP and European and some other white cultures, the working women who do stay married are rapidly deproletarianising their husbands and themselves. Because of the automation in the kitchen, the television in the living-room, the gain that more husbands do rather more household chores and fewer spend all evening in the pub, the astonishing sameness of Sainsbury’s sales per household as between income groups, the spread of house-ownership and of the motor car to go shopping in, the fact that it is three times as easy as in 1928 for a work-seeking mum to get a job, the living standard of many a British working man’s wife has risen above what Keynes thought in 1928 that Britons would very much wish to have. A lot of the working women concerned cheerily recognise this, and thus act and vote slightly mean-spirited conservative. Progressive people a bit richer than they are very cross to be told it. The way to regard oneself as a socially caring person is to advocate that more of other taxpayers’ money be spent to build up public services (education, health care, housing, etc) for the poor. Unfortunately, as soon as something is turned into a public service instead of a market enterprise, it is nowadays produced with more bias against the poor. From some London council estates today parents can be forced, by sanctions of the criminal law, to send their son to a state school which has a 20 times greater chance of making him a juvenile delinquent than another state school in the same catchment area. It is a peculiarity of the non-market system that these dreadful schools are not closed. If a candyfloss shop poisons 20 times as many children as that next door, truant officers do not whip children into it. In some slumdoms of Britain and America, police protection has virtually broken down; old ladies do not go out at night. The whole British system of crime prevention lacks an enterprise culture, so British prisons have an actually negative gross production they create more recidivists than they cure criminals. Britain will eventually have to move to some profit incentive in prisons: rewarding those who run prisons with more money and kudos when and only when fewer of their inmates re-offend, thus concentrating their efforts on job-placing on release or whatever works. Life expectancy in the British middle classes has-expanded faster than in the poorer ever since the foundation of the National Health Service in 1948; things were expected to happen the other way round. England’s poor north-east has seen some of the country’s best shopping centres and small businesses grow in the past decade, but the social workers in one poor part of it misread from a MORI poll that one in ten British fathers raped their small daughters (which they don’t, MORI had suggested nothing like it). When these sincere people thought they should be arresting one in ten of the dads they met, the case for not having local-authority monopoly organisations to run social services did seem rather strengthened. In housing, the story has been worst. If graduate James bought a suburban London house in 1948 which a supposedly wicked “speculative builder” had erected for £200 in 1898 or for £2,000 in 1938, James grizzled furiously that council-house Jimmy was getting, for much lower weekly outgoings, a fine high-rise-view apartment “attractively” closer to the centre of the city which had cost the taxpayer much more to build. James was half-placated by getting tax dodges like mortgage-interest relief. Today James’s house is worth a fortune of up to £250,000 which he can pass on to his children. Because of the terrible inefficiency of council-estate management, Jimmy still lives amid graffiti and drugs and a smell of urine, without proper police protection in that same high-rise apartment, where his life has deteriorated into an old person’s hell. There are at least three reasons why state monopoly production fails, and they can now be seen to be endemic: i.e., if you care about helping the poorest, state production can’t work. First, as soon as nil price or subsidised price ensures that there is a standing excess of demand over supply, the best services (e.g., brightest teachers, most competent doctors, politest policemen) go to Surrey instead of Slaggers End. In the private sector, by contrast, a supermarket complex does open in Gateshead if there is demand there; the supermarket entrepreneur does not say he prefers to live in Guildford. Second, only a competitive system will bring the quickly changing technology and methods most suitable for meeting each individual’s needs in a changing modern market like education or crime prevention or social services. It is fatal to leave them in protected producers’ hands. Third, a state-spending culture brings the pressure “such and such is doing badly, let’s pour money into it”. A market-enterprise culture says, “that’s doing badly, we’ll make money by throwing in competition and closing it down”. These three points explain why state provision is now failing, not only in the free capitalist world, but also out in socialist Russia and China and all points east and south. This has at last brought the right nomenclature there. A conservative in communist countries is now somebody who believes in state ownership of the means of production, distribution and exchange. A progressive is an Adam Smithian. In rich countries the sensible course for caring left-wing parties would also be to get on the free-market side of the conservatives. Unfortunately, they are getting on the protectionist side instead. Also, if a government calls itself lefter wing, it starts by saying it will spend more to cut unemployment, but its own name for itself then forces it to cut public spending even if at Spain’s unemployment of 19%. This is because frightened money markets unfairly allow a bigger budget deficit to a Reagan than a Rocard. During 1989 this will again hit Mr Mitterrands franc. For the next decade or so, the intellectual and political trend therefore seems likely to he generally to the right. The next article will discuss if it may go too far. Norman Macrae looks forward to the end of politicians. IT is possible that the word "privatisation" first appeared in print in The Economist, just over 30 years ago, It was suggested by somebody now dead, who may have subconsciously pinched it from some-thing published earlier somewhere else. For those who used it in these columns, the word then seemed part of a hopeless crusade. In the 1960s it was hard to persuade even sensible people how wrong were those like J.K. Galbraith, who told eager politicians that the interests of the poor could be served best by spending much more of GDP through politician-dictated monopolies in-stead of market-leading common sense. Actually, in the 1960s rich countries were achieving marvellously greater equalisation in almost everything provided by private enterprise, but the underclass became further downtrodden in America's and Europe's inner cities whenever services were instead provided from the public purse. For the first time in history, millionaires and welfare mothers were spending their leisure hours in the same way: watching the same television programmes, from armchairs of the same comfort in similarly heated rooms, while other consumer durables spread to the living rooms, kitchens, bathrooms and (in some countries) parking spaces even of the few unemployed. So did opportunities for holidays in the sun and purchases of clothes; remember that in 1945 the average Englishman had owned only one pair of trousers. Supermarkets spread from the suburbs to the slums, and found similar expenditure per consumer there. There was no such equalisation between suburb and inner city in things where public servants spent increasingly more of the taxpayers' money. This was especially true on the worst public-housing estates, from which 90% of an area's crime might emanate; where it became unsafe to walk down graffiti-desecrated corridors, because anything that belonged to the community was deemed to belong to nobody; where life deteriorated into drugs, hopelessness, squalor. The luckiest young Londoners returning from the war in 1945 were those whose applications for flats in these great new tower blocks overlooking the Thames were, to their fury, turned down. They had to buy, for perhaps £1,500 in 1950, supposedly shoddier homes built by "speculative" builders several decades before, with weekly mortgage payments at about thrice a favoured council tenant's rent. Forty years later they had a capital asset worth perhaps £150,000, while the "favoured" tenant had something worth nothing, except a vicious circle of hell. In the inner cities, police protection, state education, safeguarding of poorer people's life environment grew steadily and - for both taxpayer and customer - ever more expensively worse. After vast inpouring of public money, people in poor areas had to send their children to more modernly-built but much nastier and less parent-selected schools, where their kids had a growing prospect of being turned into drug-addicted delinquents. After quadrupled spending police protection in the Bronx, the prospect of a mugger being apprehended there fell to under 2%, so mugging became an attractive way of teenage life. In Lyndon Johnson's presidency, 1963-69, America created a huge welfare state, which proceeded to cripple instead of aid its clients. All of the forward indices of misery (illegitimacy, welfare dependency, lack of neighbourliness, crime, drugs, riot so as to loot) grew worse. In Britain the "commanding heights of the economy" had been nationalised originally on the argument that it would be too easy to make vast profits in these great monopoly industries (like coal, rail, steel, ship-building, public utilities). As soon as the state took over these industries, they plunged into vast losses instead. They were operated in the interest of their unions, instead of their customers, and without any innovative spark. If a middle manager in a private company thinks his boss is making a horlicks of his job, he can set up another firm in competition. If he is in a state firm, he writes a memorandum which says the boss is making a horlicks; and loses all chance of promotion. In Russia he got shot. The inefficiency of state spending in rich countries was shown further when the mighty United States began to lose a war to slightly ridiculous North Vietnam, despite spending 1,000 times more money on its arms and soldiers than did Hanoi. Nobody listened, then everybody did. At the time I was doing some moonlighting work with an American management consultant. Together we tried to invent new Greek-derived words, distinguishing between activities which were wholly driven by customers' demand (and were generally succeeding), and those driven by expenditure of taxpayers' or sometimes private money (whose productivity declined with each extra zillion pumped in). None of these Greek words caught on. In The Economist we tried terms like recompetitioning and privatisation. Privatisation was meant to signify the return to profitable private motivation of anything that had declined through unprofitable state intervention, in Europe usually through state ownership, in America usually through excessive regulation (including what Herman Kahn called "health and safety fascism"). The clear advantage of privatisation was that everybody working in private businesses, from the entrepreneurs to the often non-unionised workforce, got more money if their new ways of doing things succeeded (a success they sometimes overhyped). If they did not attract more customers, they went bust. People in public activities soon learnt that they got more money if their settled ways of doing things failed, because then they could wail that governments must pump still more money to them. One school in south London produced 80% of the juvenile delinquents in its area; the educational authorities directed ever more money to its often absentee and strike-ridden staff; because so many of their pupils were truant (sometimes after a hard night mugging), they clearly faced "special problems". Today's Soviet Disunion produces far more wheat, rye, potatoes, barley than the United States; yet Moscow faces bread riots because most of it fails to reach the shops. This is because the distribution system is socialist, so nobody has an incentive to move the stuff (as distinct from either staying away or turning up just to fill forms). That is also true in many town halls across the free world. Morale has naturally deteriorated in all the activities run in the failure-welcoming socialist way. Economic decline has correlated closely with the proportion of the workforce in public-sector jobs, from Merseyside (way above the British average) to Brezhnev's Omsk(100%). But during the 1970s those of us who appealed for reform via privatisation were still generally regarded as nuts. The word barely appeared in Margaret Thatcher's 1979 election campaign. Then it took off. In the past dozen years, 1979-91, privatisation has become a real policy in more than 70 countries. Although the lead was given by Thatcherdom, some of the most extensive privatisers have been Labour governments in Australia, Scandinavia and Spain. Privatisation is seen in all the ex-communist countries as a means through which industries and services long buried under dead socialism can bring some springtime to the frozen earth above. The policy has taken wing in Japan (telecoms and railways) and the Asian dragons. It stumbles forward in the third world. Less than a decade after the Falklands war, British merchant banks are drawing fees from a Peronist government for advising on privatisations to stop Argentine industries being mismanaged by Peronist colonels. No-body could have imagined this 12 years ago. Unfortunately, much of it is being done the wrong way. Fortunately, the scope for further privatisation is everywhere huge. The rest of this article sketches a plausible future history for privatisation. The suggested timetable will be wrong, but things will move this way. Parochially, in a viewspaper published in London, this future history will most often be told as it may develop in Britain. Other countries may move at a faster pace, but this blinkering will protect the article from being diffused. It will also help emphasise that party political changes will not slow the caravan. Start with the two industries which the British Tories have promised to privatise if returned to office: coal and the railways. In our scenario these would be privatised even by a Kinnock Labour government in the 1990s, although for opposite reasons. The fudged three-year agreement, whereby privatised British electricity firms have to buy some uneconomic British coal, runs out in 1993-94. The European Commission will be bound to forbid continuance of this clearly anti-competitive arrangement. The number of viable deep British pits will then fall from today's 68 to about three. The Kinnock government would not want a nationalised coal company to fight the long strike with Arthur Scargill about this. It will therefore say that wicked Brussels has ordered coal privatisation (which it virtually will have done), and that the pits to remain open must be decided by the market. Some of the abandoned pits may have coal drawn from them by any teams of miners that find this economic, rather like anybody can go blackberrying. At first the attempted safety regulations will be tougher than potholing, but will then decay. In America the safety people were pilloried when they demanded the installation of a stretcher by the owner of a one-man mine. In the 1990s opencast mining, at present environmentally unpopular, will become environment-loved. The opencast machines rip off the topsoil, but are then required to replace it in the form that local people want which is no longer for agriculture, but as golf courses and pony-trekking land. This helps mitigate one of the worst drains on enterprise, which is that planning restrictions tend to forbid any land to be turned to alternative use. The railways will gain from the prejudice against changing land use. In the 1990s and 2000s crowded countries like Britain will sensibly turn to charging for occupying the roads. An electronic attachment on each vehicle, especially each lorry, will be activated whenever it enters an area where it adds to delay-causing traffic jams. The bill will be sent to the vehicle's owner, and be-come quite high. Coupled with technology that makes it much faster to load and unload containers at railhead, railways will be ripe for privatisation. As argued by Oliver Letwin (the Tory candidate standing against Glenda Jackson in Hampstead), a privatised railway system will become rather like an airport. A centralised body (which may not be privatised until the 2010s) will run the safety and signalling system. If anybody in the early 1950s had said how many thousandfold would rise the passenger miles flown on the airlines, and yet with a large drop in accidents, he would not have been believed. His surprise would be greater when told that efficiency would increase fastest when Ronald Reagan sacked all America's public-sector air-traffic controllers for going on strike. Today, incoming and take-off aircraft rarely run into each other, even though landing slots are being "chaotically" sold through private agents, even though all sizes and speeds of aircraft are taking off from and homing into the same narrow and some-times foggy runways. Thus it will become with the privatised railways. The opening of the Channel tunnel will allow new railway locomotives into Britain, which are half as expensive as British locomotives now and of much more varied design. Light railways (often driven by computers, sometimes by volunteer commuters) will run from exurbia to connect with rush-hour commuter trains, suddenly making profits again. Lush cruise trains will take rich Americans and Japanese through the cultural centres of Europe. The end of duty-free drinks at European airports in 1993 will be mitigated for international trains, the one form of transport where booze does no damage. Slightly more important, the railways will make money from the fibre-optic and other cables or the new-technology pipelines laid beside their tracks. Most important, property development will boom at stations and on other parts of the railways' ridiculously underused land. The world's richest billionaire in 1991 is a 55-year-old Japanese who spotted the money to be made from railway land in Japan. By the early 2000s the successful privatisation of British Rail will be followed by privatisation of the Bundesbahn, the trans-Siberian railway and every other railway on the Eurasian land mass. The success of railway privatisation will set the tone for the proper competitioning of other utilities. In electricity the grid should usually belong to a separate organisation, and entrepreneurs make money by feeding competitively into it. By the late 1990s the partial success of British electricity's privatisation will mean there is some sort of commodity price per kilowatt hour of electricity on the European grid. Suddenly scientists will manage, eg, to isolate hydrogen from something in which it abounds, like seawater, and feed it as a power source much more cheaply into that grid than electricity from coal or gas. This will be followed by the discovery of ever cheaper ways of releasing energy from storage in matter. All will come competitively into the grid. In the gas industry, British Gas will have lost its monopoly, because cheaper gas from Siberia will have to be allowed into its pipelines, after the 1996 free-trade agreement with the post-Gorbachev Soviet Union. During the brief 1991 Gulf War the Japanese invested in ways of bringing frozen natural gas from all round the Pacific. These will succeed. The near-bankrupt oil wells of the Middle East will have to follow, by exporting similarly cheap gas by all means to Europe and America. As energy prices fall, food prices will dramatically accompany them. After free trade with Russia, the EC's common agricultural cartel will collapse. Cheap food will pour in by rail from the black earth of Ukraine, as cruise trains to Samarkand pass them the other way. Telecommunications (whose grid is anyway disintegrating with mobile telephones) and television (recompetitioned by satellite) will also leave the public sector entirely. In tones similar to today's lessons about 19th-century child labour, sociologists will tell with horror of the exploiting classes' device named the BBC. A poll tax (called the licence fee) was levied on every family, even poor widows and pensioners in Hackney, in order to impose on them toffee-nosed programmes which only the upper middle classes (in the name of "culture") thought they wanted. Actually, as we will soon learn, the BBC's brief 74 years from 1922 to 1996 were when British culture rotted worst, because it was brought under duopoly control. During the late 1990s the privatisation of the social services will gather worldwide pace. The first privatisations will take some disguised form of the "voucher" system discussed for decades. Everybody except the teachers' unions will see that schools should get money only if they attract pupils. Dreadful schools, which parents shun, should be closed. Each child will carry a voucher, paid for by the state, to the school of his choice. "Choice units" in each area will take parents round available schools, to show what is on offer. Many people will rightly say that children from disadvantaged backgrounds should have specially topped-up vouchers, so that schools should compete most keenly to attract them. At juvenile courts, orders will be made to increase the vouchers for offenders; some-times the parent will be ordered to pay the topping-up. Both the American and British health systems will gravitate towards a system of health maintenance organisations (HMOs, or bodies that compete to get your capitation fee, and then seek to provide all your health-care needs as economically as possible). In America the present fee-for-service system has proven quite uneconomic. Doctors make more money if they treat patients as expensively as possible after they become ill. The patients do not mind this money being spent, because it comes from insurance cover paid for under tax incentives by their employers. In its umpteenth attempt to stem the federal budget deficit, sometime in the 1990s, the American Congress will see that it can save tens of billions spent on hypochondriacs a year if it grants tax relief on employers' health insurance only up to the point where everybody can pay a basic HMO capitation fee. If anybody wants more expensive fee-for-service medicine, he must pay for it out of taxed income. Britain's NHS has always had something like an HMO system for its family doctors or general practitioners (GP's). But nearly 90% of British government NHS spending has gone to hospitals with hierarchies of state-salaried doctors, nurses and far too many trade-unionised workers (three times as many as in some of the better Japanese hospitals). The GP system, whereby Britons choose their family doctors and the government pays those doctors a capitation fee, has been reasonably successful. By any criterion of cost effectiveness, the NHS hospital system has not. In 1991, amid loud and sometimes mendacious political controversy, some seeds of reform have already been sown. Under the 1991 NHS reforms, budget-holding family doctors will compete to get patients into hospitals without waiting lists, and hospitals will get more money only if they thus attract patients. There are only minor and gradual steps from this reformed NHS system to a proper HMO system. Under any governments in Britain, those steps will occur. They will probably occur rather faster under a Labour government. Labour 1992-96 will have less public money to spend on the NHS than the Tories, because it has promised to spend so much more on other things, and (partly thereby) is bound to scare more money out of the country. Labour will have to try to spend the annual £30 billion or so on the NHS more effectively. The row about Tory reforms is that Tory "trust hospitals" then proceed to sack workers. Since British hospitals have long been overstaffed, that is what any reforms (including Labour's) will have to aim for. British prisons have long been a ridiculous public service, with negative gross production. They create recidivists, instead of cure criminals. A 20-year-old who is sent to prison is more likely to become a habitual criminal than one who narrowly escapes being sent there. America has moved towards some private-enterprise prisons, whose entrepreneurs will be paid more if their inmates do not recommit offences. In the decade 2000-10, governments will recognise that the same "recompetitioning" is also highly desirable for the police. Modern police forces have huge computer files of genetic fingerprints, ordinary fingerprints, case histories and behaviour patterns of particular villains and for particular crimes. These files are secret to everybody except the police, who (being a public-sector body) are PC Plods who are not innovative at using them. In the early 2000s the increased efficiency of hackers at breaking into secret files will bring scandal about the police into the media in many countries. There will be accusations that the police are deliberately not tracking down some big gangs of criminals, ostensibly because those criminals are paying them with information about other criminals, but really because they are paying them money. In Britain police will be found still concocting cases against black people, Irish people, long-haired youths, short-haired youths, other folk they dislike. The interesting question will explode: why should police files be kept secret? Some civil libertarians will say "the police have to keep secret the record of petty offender Joe Bloggs, because it would be wicked if all his neighbours know it." A compromise will be effected whereby each computer file, though thrown open to investigation by many competitors to the police, will have a number instead of proper name attached. After a certain stage in a criminal career, even that anonymity will be removed e.g., for the under 1% of people who commit over 50% of some crimes because, on release, they go straight back to offending and soon to prison again. Even in the early 1990s, each year spent by anybody in prison in Britain costs the state £25,000. Gradually, the whole unsuccessful police and justice system in most countries will be transformed, by recognising that it should be a modern open-to-everybody information industry. By 2000 the cost of lawyers will be falling fast. People will recognise that most of the work of lawyers can be done more quickly by telecommuting into programmes that interpret the statute law of England. Those programmes will answer the specific question you have posed via your personal computer. Cases in non-criminal law will then increasingly be settled by each side putting its case to the computer, and agreeing to accept its verdict. When a suspected criminal is arraigned before a court, the first question will at last rightly become "did he do it?" Until after about 2010, suspects will still be able, if they wish, to insist on submitting themselves to the present lottery system of adversarial lawyers, widely differing juries and erratic Lords Justice. But more and more criminals will agree to plea-bargain after seeing on computer file all the evidence against them, and the computer's judgment of how little chance they have of getting away with their defence. The courts will then usually go on to the next and civilised question, though preferably with the lightest punishment: "how best can we discourage you from doing this again?" There should be lots of competing organisations offering "if the state will pay us the £25,000 a year that it would otherwise cost to put this man in prison, we will try to reform him within the community in the following way. If he recommits an offence within a certain time, we lose our fee." Sometimes that will require electronic tagging of the man concerned. If so, he should have some choice of which regime he prefers. There will be an increase of "bobbies on the beat" (i.e., policemen within the community), but various competitive bodies will start submitting tenders for this job saying they will seek to simplify their tasks by, e.g., better street lighting near notorious trouble spots. Then, around 2010, local authorities will begin to change their way of providing municipal services. It is absurd that you should have to vote either Conservative or Labour when choosing who best can man-age your drains. Multinational corporations will appear On the ballot for local elections. They will say: "We will charge only this level of poll tax or property tax. We will promise by contract to reach the following targets for reduction in the crime rate, for environmental cleanliness, etc. If by the judgement of independent auditors we fail, we will have to remit some of your property tax to you. But we are confident we can fulfil this contract, and make a profit for our-selves at this level of property tax. Liverpool and New York city will be-come two of the first areas to elect commercial firms instead of politicians as their municipal authorities. By 2015 there will be only two main "public goods" left in the sense economists use the term (things best provided by government rather than markets). These two remaining public goods will be redistribution and military protection. These will then become competitivised. Some part of redistribution can be handled by insurance. "I want to make sure my income never falls below half the average income": for some people, that could be an insurable risk. Others, such as the handicapped, some elderly and a few children, need special help. This can best be provided competitively. Children in the care of local-authority homes in Britain have an appallingly higher delinquency rate than other children, including those from equally troubled families but foster-parented or in charitable institutions like Barnardos. "Public sector" means there is a trade-union row if employees are sacked for mere inadequacy, or for monstrous incompetence. In institutions on performance contracts, there can be a continuous search for methods that succeed. These performance contracts will eventually spread to tackle poverty. In the early 1990s the United States has 13% of its population below the officially defined poverty line, but an American has less than a 1% chance of staying long in poverty provided he or she does three things: completes high school, gets and stays married (not necessarily to the same person), stays a year in his first job even if at the minimum wage. People will start to bid for contracts to try to help "endangered people" thus to avoid being long in poverty, and some of the con-tracts will work. The future of defence can be seen from what happened in the Gulf war. Long-distance rockets can already be pinpointed down the bedroom ventilator of any dictator, or on to any of his lorries and tanks. More sophisticated weapons than that are not going to be needed any more. Idealists say that military operations should be put under the control of the United Nations. Since many of the nastiest dictators have votes in the UN, that would not work. But in the next two decades NATO will more or less join with the old Warsaw Pact, in what will become a rich man's club. NATO-Warsaw will keep a register of arms sent to any poorer countries, and will start to forbid any such sales. It will gradually assume a world policeman's role. It will equip itself at lowest price with stuff that actually works and will therefore probably buy much of its electronic hardware from the Japanese. It will recruit its soldiers in the cheapest high-quality markets: Gurkhas, Britain's SAS, Sons of old soldiers from various villages round the world with fighting in their blood. By the 2020s it will be recognised as absurd that only the Republican and Democratic parties should field serious candidates for (say) the 2024 election for president of the United States. A competing "contractual" candidacy will be emerging a cabinet team who say they will never raise income tax above 10% (watch their lips), but will contract to provide government of the following quality..